Unsaturated Polyester Resin based Materials | Products | Tokan Material Technology Co., Ltd.
For solid surface treatment of modular baths to roads. Gelcoat and Top Coat are used as surface coating materials for modular baths and washstand countertops as they not only protect the surface of FRP (fiber-reinforced plastic) products but also provide superior finishing. TOMATEC's rich product line includes approximately 15 types of related products whose weatherability, water resistance, and chemical resistance have been improved using proprietary technology. Our offering includes products not only suitable for FRP products but also for a wide range of applications such as waterproofing and paving of roads, rooftops, and factory floors. 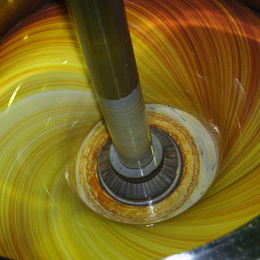 Gelcoat has been used as a surface coating material to make the surface flat when casting FRP products. TOMATEC's Gelcoat boasts excellent resistance to water, which makes products durable to surface blushing and blistering, excellent weatherability, making products hold out against yellowing and discoloration, and excellent resistance to chemicals in addition to excellent work efficiency. These characteristics make them suitable for a wide range of products, from plumbing products such as module baths and washstand countertops to outdoor products such as exterior automotive trims and blades for wind power generators. •Main Applications: Water tank, pool, module bath, automotive parts, cover, windmill, pleasure boat, yacht, etc. 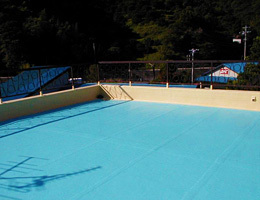 Top coat is generally used as finishing material in outdoor waterproofing works. TOMATEC's Top Coat is similar to Gelcoat: It has excellent resistance to water, which makes products durable to surface blushing and blistering, excellent weatherability, making products hold out against yellowing and discoloration, and excellent resistance to chemicals in addition to excellent work efficiency, and is used in waterproofing works for not only balconies and house tops of standard homes but also for a wide range of constructions such as building rooftops, parking structure, swimming pools, and fish tanks of aquariums. •Main Applications: Waterproofing of balconies and rooftops, swimming pools, fish tank of aquariums, interior of boats and ships, etc. Is a top coat for roads based on methacrylate resin, with superior weatherability and durability. 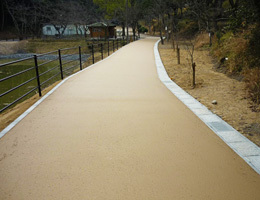 Currently, most commonly used top coats for heat-shield pavements are based on methyl methacrylate (MMA) resin, which has low cost but may raise concerns with residents depending on the area of use as it produces a distinct, pungent odor. In contrast, TOMATEC's "Low Smell Fine" is based on a special resin whose odor level is 1/3 of that of the MMA resin. For this reason, it can be used safely not only in urban areas where rows of eateries and houses stand side by side, but also without exposing construction workers to health risks. 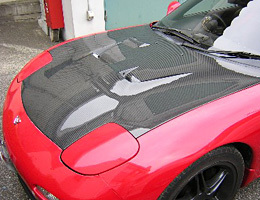 Furthermore, it can be used for heat shielding which is effective for lessening the heat island phenomenon as it restrains the rise of the pavement temperature. It also contributes to the simplification of construction works as anti-slip ceramic can be dispersed in advance, reducing the need for spreading aggregate on site. 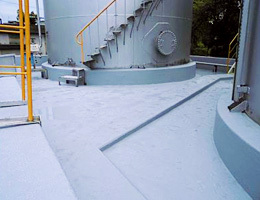 Factory floors and concrete structures in a variety of treatment plants need a tough coating material since they are exposed to an extremely corrosive environment. TOMATEC's anti-corrosion top coat is a surface coating material whose main component is vinyl ester, which contributes to the protection and extension of the service life even under such environment. Due to its superior resistance to heat, durability, and resistance to chemicals, it is used in places that require high-grade anti-corrosion work such as sewage treatment plants and building pits. Furthermore, we also have people and environmentally friendly, styrene-free products that prevent the generation and spread of environmental pollutants. 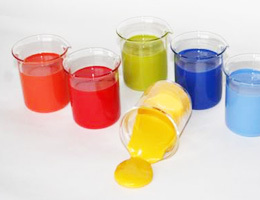 TOMATEC toners are non-toxic colorants for FRP. For colors, we use the Standard Paint Colors defined by the Japan Paint Manufacturers Association as base to mix colors according to a customer's request. 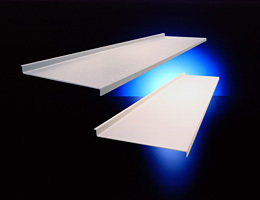 Also, TOMATEC putties for FRP are made of carefully selected fillers to glue and fill. Our offering includes a variety of grades to meet diverse customer requirements on application, performance, usage conditions, etc. Common characteristics of these products, very appreciated by customers from a wide range of fields, are good storage stability, resistance to color separation after coloring, good dispersiveness, and good workability (putty is easy to apply and spreads smoothly). •Main Applications (Toners): Non-gel coated FRP products such as septic tanks, middle coat for waterproofing, coloring of laminated plastic, etc. •Main Applications (Putties): Gluing of FRP to FRP product and FRP to wooden product, filling of corners, unevenness adjustment before lamination, etc. BMC is a ready to mold filled and reinforced thermoset resin material to produce kitchen countertops and washstands. TOMATEC BMC is manufactured by mixing mineral filler, glass fiber and colorant with unsaturated polyester resin in a mixer. It contributes to the creation of attractive products not only for its design-ability as artificial marble but also for its excellent dimensional stability and high cost-effectiveness. • Main Applications: Kitchen countertop, Washstand, Sink etc. History of Tokan Material Technology Co., Ltd.